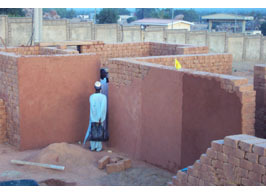 In 2002 Crocker Ltd was contracted by the government housing program of Jigawa State in northern Nigeria to provide ten Adobe International pressed block machines and provide the training in their use and in the construction of earthen homes. 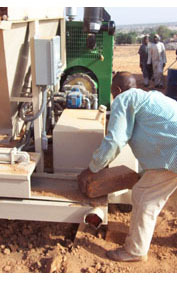 The Adobe International Earth Press II generated 11 blocks per minute using local soils. 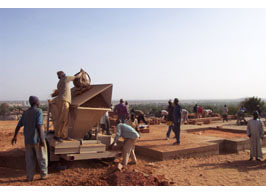 The operator monitors the machine's performance and verifies the quality of the blocks as they are ejected from the press. 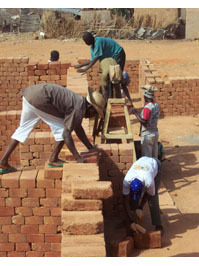 A crew of 22 masons and laborers was required to stay ahead of block production. 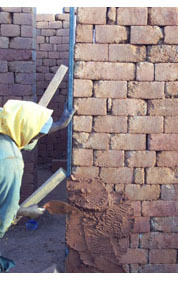 In this instance, the block was dry laid, as the adhesive and cohesive qualities of the local clays was extremely high. 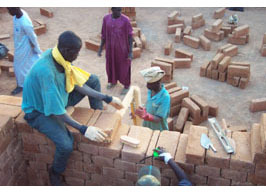 Blocks of varying sizes can be instandly produced to maintain staggered joints. 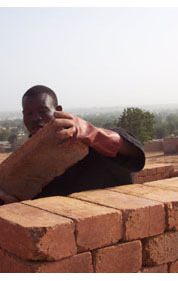 Part of the training involved the use of native soils for the interior and exterior plasters following the traditional methods of the area. Several test patches were applied before the most durable mix was developed. 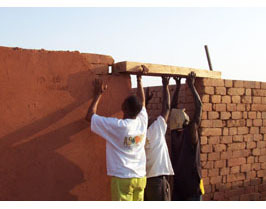 Lintels are installed at the openings.